December is one of my favorite months. I love the anticipation and preparation for the holidays. But with all the busyness and extra events that come up in December, dinner at home starts to drop on the priorities list. The idea of spending hours grocery shopping, prepping and chopping, cooking in multiple pots and pans, and then the CLEAN UP?! Don’t sign me up for that. But eating pizza and take-out every night of the week is not my idea of a good time either. 4.) doesn’t require a lot of clean up. 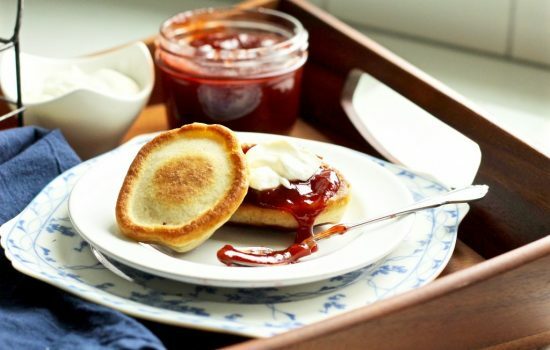 This recipe is an all-around winner! All you need is four easy to find ingredients, five minutes to toss it together, one hour to bake it, one pan, and just a few minutes to clean it all up afterwards. The best part is that it is absolutely delicious. 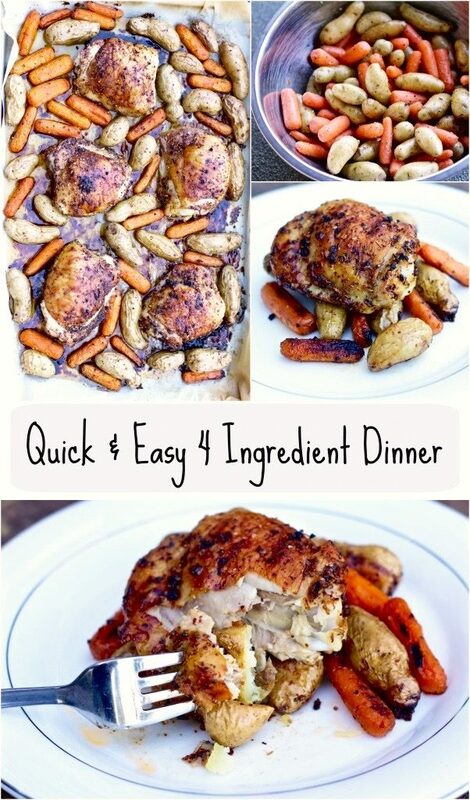 Try this quick and easy 4 ingredient dinner tonight…nobody but you will know how simple it really was! Hungry for more? Sign up to get exclusive content in your inbox! 1 lb baby potatoes OR potatoes cut into wedges (with skin on) Red skin or yukon gold potatoes work best if you are doing the wedges. Preheat oven to 450°. This may be hotter than what you’re used to, but it’s the perfect temperature to get the job done quickly, give the chicken a nice crispy skin, and caramelize the carrots a little. Pat dry chicken thighs with a paper towel then season generously and rub in the spices. That is ALL you need to do! No cleaning or deboning the chicken is required. The skin will help keep it extra tender and juicy and is easy to remove before eating if you prefer. 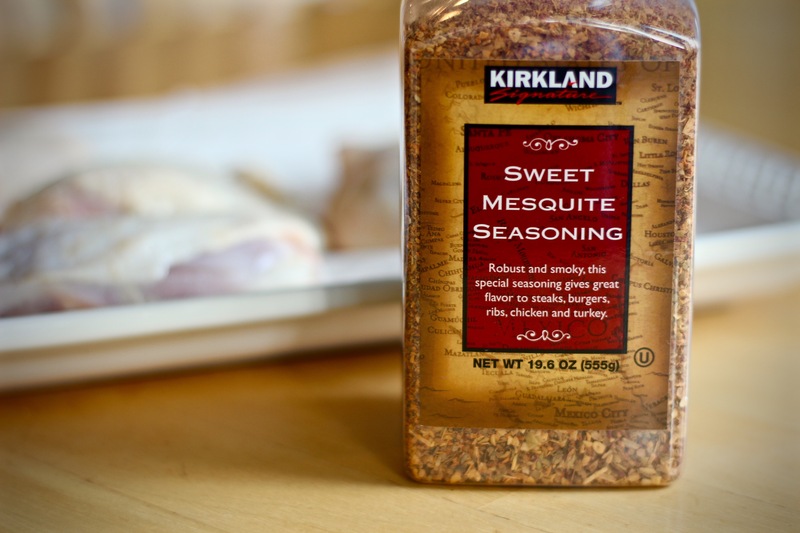 I used this sweet mesquite seasoning from Costco. It is sooo delicious on chicken thighs! It gives a slightly smokey and sweet flavor to the meat. Also really easy because you don’t have to use multiple spices; this mix has all you need! 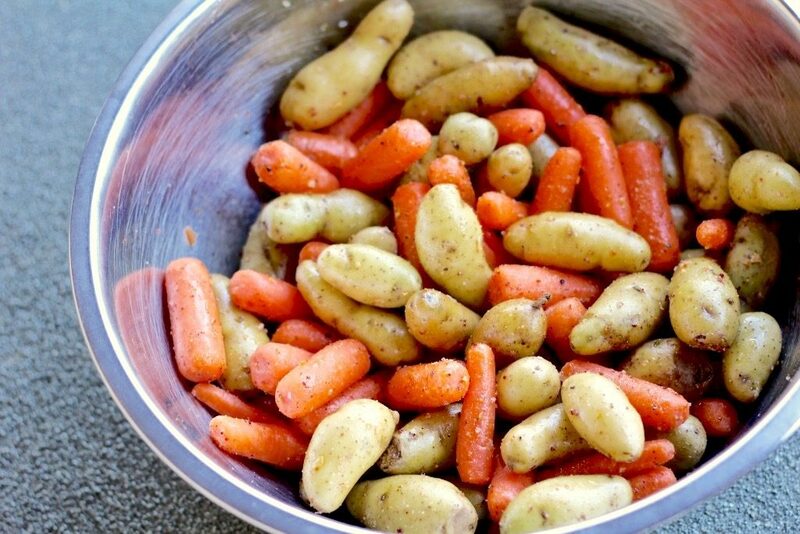 Rinse baby potatoes and toss in a bowl with baby carrots, 1 tbsp olive oil, and same seasoning you used for chicken. 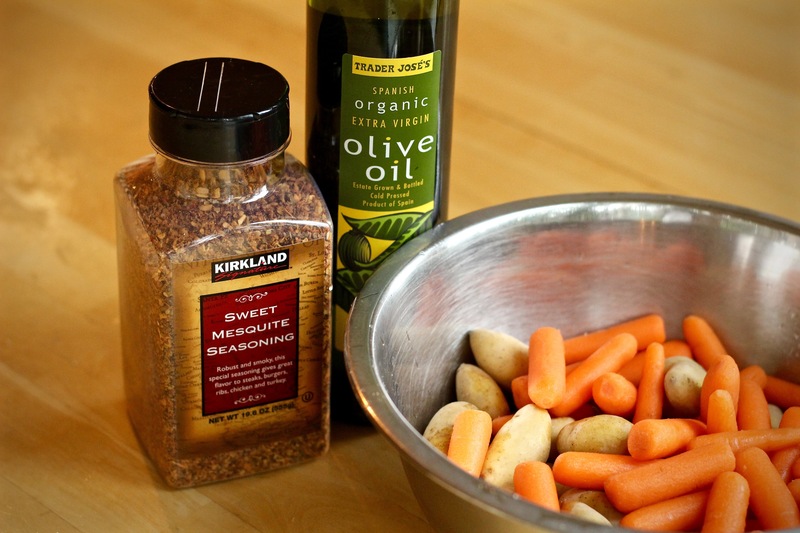 You need just enough olive oil to coat the vegetables and help the spices stick to them a little better. There will be more fat from the chicken thighs as they cook so don’t go overboard with the oil here. 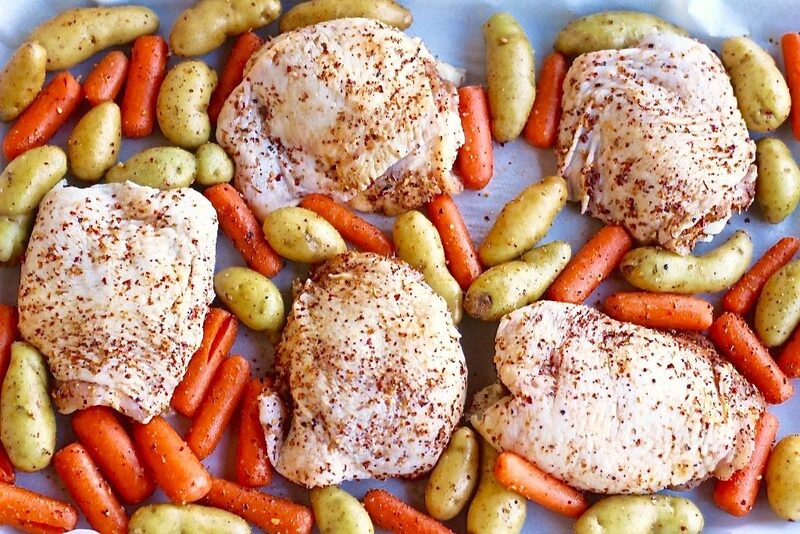 Arrange chicken thighs on parchment lined pan and fill the spaces in between with seasoned veggies. Loosely cover with foil and bake for 45 minutes. Uncover and bake for an additional 15 minutes until chicken skin looks crisp and browned. Serve this with your favorite side salad like this Caesar salad. The best part is that the clean up will take you about two minutes and you can enjoy some relaxing time with your family after dinner. Love this easy dinner recipe? Try our crispy baked chicken thighs next time! 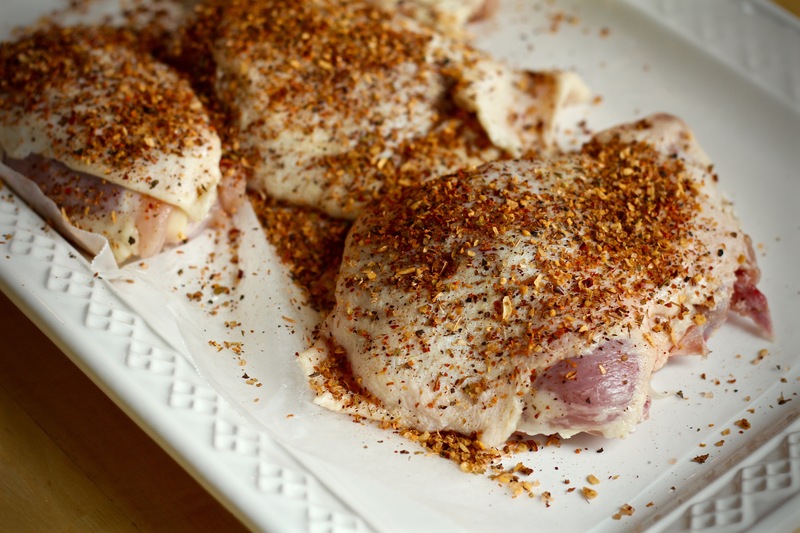 Pat dry chicken thighs with a paper towel then season generously and rub in the spices. 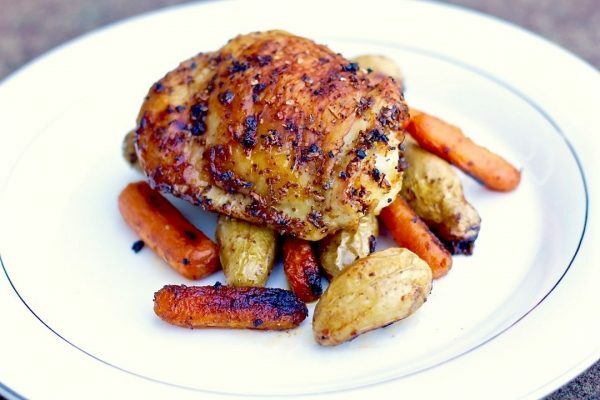 Rinse baby potatoes and toss in a bowl with baby carrots, 1 tbsp olive oil, and same seasoning you used for chicken. 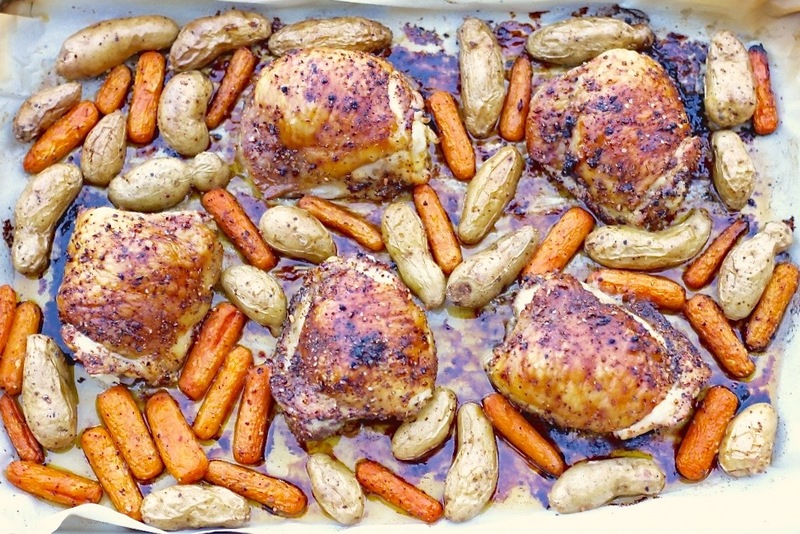 Arrange chicken thighs on parchment (or silicone mat) lined pan and fill in the spaces in between with seasoned veggies. Serve with you favorite side salad! Yay! Husband approved is a must! So glad you guys enjoyed it! I would definitely add a good sized cut up onion! Who cares if the kids don’t like it! Yes Kristin! I’ve also made this with pearl onions to fit the theme of the small carrots and potatoes. I buy them peeled and frozen from Trader Joe’s, that way all I have to do is just toss in a cup of them without any prep work! Thanks for reading! I fixed this for supper & it turned out great!! Next time I’m going to add either 2 large sweet vidalia onions quartered or the same # of whole onions as pieces of chicken, core the center out & after brushing it with a good bit of butter & putting a pat of butter in the center sprinkle them with the same seasoning. One thing I really liked was even though I’d had a bad migraine most of the day, this was easy enough to throw together that by the time my husband got home from a 11hr work day… I had a hot meal all but ready!! All I needed him to did was to fix something green…which we could have done without. Except in the south we’re taught that when you fix a meal there’s a meat & at least 2 sides…one which has to be green…lol. Definitely a keeper!! Thanks for a great easy recipe!! Wow Patty thank you so much for the feedback! Totally makes my day to hear someone enjoyed the recipe! I can totally agree with hat rule haha, gotta eat those veggies! And yes, onions will be a great addition to this dish! If you’re a fan of the oven roasted root vegetables, easy recipes, and are looking for a side that also has some green in it, try our roasted veggie recipe! I think you’d really like it. I used 2tbsp melted butter in the oil to coat the veggies and chicken. I just added some Italian seasoning, garlic powder, and the salt and pepper to he oil mixture to coat the veggies and chicken before placing in a 9X13 pan. I added some Brussel sprouts too for the greens. Since I’m the only one who eats this, I divided the leftovers into 16 oz containers and froze them for later. Can be re-heated in microwave on high for about 3 1/2 minutes on high, or in a 350 degree oven in foil for about 15 to 20 minutes. Thanks a bunch for sharing this. So glad you enjoyed it Jacqueline! Brussel sprouts sound like a delicious addition and I love the idea for seasoning the oil before tossing the veggies in it! Thanks for reading! 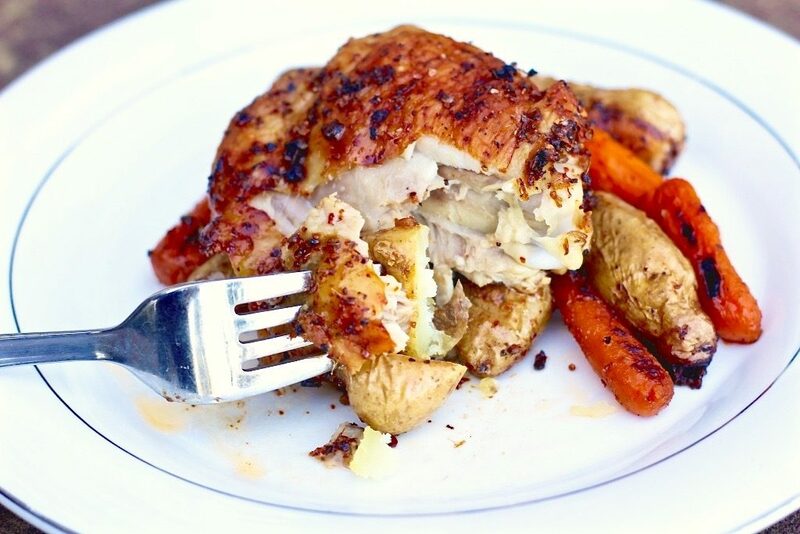 Can you use skinless chicken thighs? Heather, yes you can! I prefer the ones with the skin on because they turn out way juicier and more flavorful. If you really don’t like the skin (even if it’s crispy), it can easily be removed before serving. I’d recommend doing it that way so you keep the meat moist while it’s cooking in the oven. Awesome! Thanks so much Victor! Can you make this with chicken breasts? Hi Katharine! Thanks for the question! 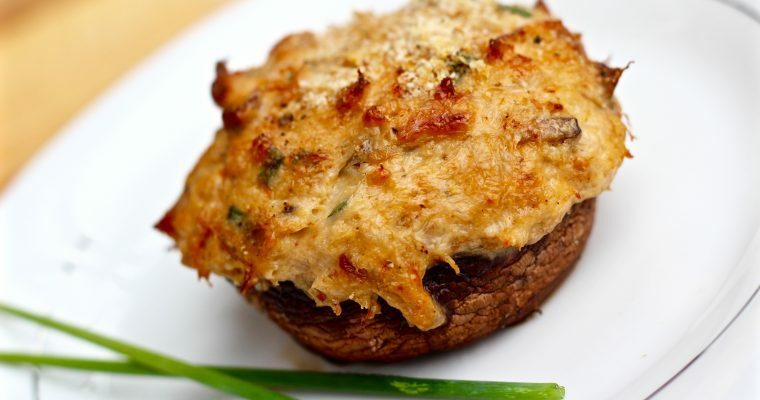 You could make this with chicken breast, but use bone-in skin-on. Otherwise it will turn out too dry. (You can easily remove the skin before eating if you don’t like it.) With the high temperature used, you really need the skin on the meat to keep it tender, flavorful, and juicy! Making it for the second time! 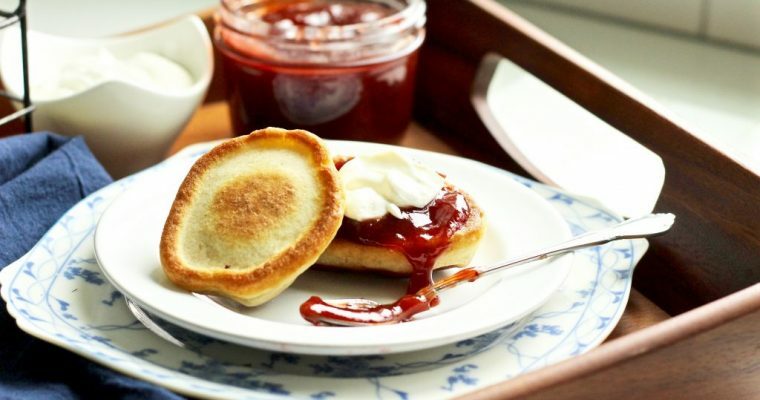 Quick and delicious, shared recipe with friends and family! Awesome! Thanks for the great review Dawn! Aww thanks D! That’s so good to hear! Glad you & your picky eater like it! I made it with boneless skinless chicken thighs…… I realise though that the olive oil amount needs to be really small….. But the prep time to table time was really short and the taste was great. I did use some other barbque powdered seasoning (i use it on everything). Thanks for an awesome recipe will be doing it again.